For other uses, see Equator (disambiguation). An equator of a rotating spheroid (such as a planet) is its zeroth circle of latitude (parallel). It is the imaginary line on the spheroid, equidistant from its poles, dividing it into northern and southern hemispheres. In other words, it is the intersection of the spheroid with the plane perpendicular to its axis of rotation and midway between its geographical poles. A planet is an astronomical body orbiting a star or stellar remnant that is massive enough to be rounded by its own gravity, is not massive enough to cause thermonuclear fusion, and has cleared its neighbouring region of planetesimals. A circle of latitude on Earth is an abstract east–west circle connecting all locations around Earth at a given latitude. On Earth, the Equator is about 40,075 km (24,901 mi) long, of which 78.8% lies across water and 21.3% over land. Indonesia is the country straddling the greatest length of the equatorial line across both land and sea. Earth is the third planet from the Sun and the only astronomical object known to harbor life. According to radiometric dating and other sources of evidence, Earth formed over 4.5 billion years ago. Earth's gravity interacts with other objects in space, especially the Sun and the Moon, Earth's only natural satellite. Earth revolves around the Sun in 365.26 days, a period known as an Earth year. During this time, Earth rotates about its axis about 366.26 times. Indonesia, officially the Republic of Indonesia, is a country in Southeast Asia, between the Indian and Pacific oceans. It is the world's largest island country, with more than seventeen thousand islands, and at 1,904,569 square kilometres, the 14th largest by land area and the 7th largest in combined sea and land area. With over 261 million people, it is the world's 4th most populous country as well as the most populous Muslim-majority country. Java, the world's most populous island, is home to more than half of the country's population. The latitude of the Earth's equator is, by definition, 0° (zero degrees) of arc. The Equator is one of the five notable circles of latitude on Earth; the other four are both polar circles (the Arctic Circle and the Antarctic Circle) and both tropical circles (the Tropic of Cancer and the Tropic of Capricorn). The Equator is the only line of latitude which is also a great circle — that is, one whose plane passes through the center of the globe. The plane of Earth's equator, when projected outwards to the celestial sphere, defines the celestial equator. 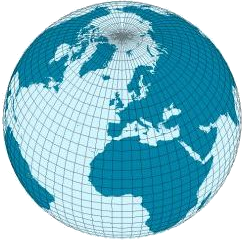 In geography, latitude is a geographic coordinate that specifies the north–south position of a point on the Earth's surface. Latitude is an angle which ranges from 0° at the Equator to 90° at the poles. Lines of constant latitude, or parallels, run east–west as circles parallel to the equator. Latitude is used together with longitude to specify the precise location of features on the surface of the Earth. On its own, the term latitude should be taken to be the geodetic latitude as defined below. 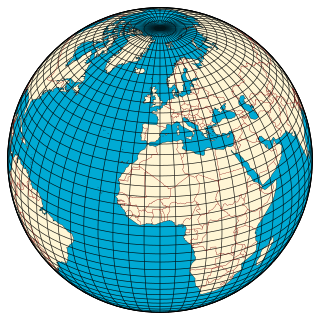 Briefly, geodetic latitude at a point is the angle formed by the vector perpendicular to the ellipsoidal surface from that point, and the equatorial plane. Also defined are six auxiliary latitudes which are used in special applications. A degree, usually denoted by °, is a measurement of a plane angle, defined so that a full rotation is 360 degrees. A polar circle is either the Arctic Circle or the Antarctic Circle. On Earth, the Arctic Circle is located at a latitude of 66°33′47.5″ N, and the Antarctic Circle is located at a latitude of 66°33′47.5″ S.
In the cycle of Earth's seasons, the equatorial plane runs through the Sun twice per year: on the equinoxes in March and September. To a person on Earth, the Sun appears to travel above the Equator (or along the celestial equator) at these times. Light rays from the Sun's center are perpendicular to Earth's surface at the point of solar noon on the Equator. A season is a division of the year marked by changes in weather, ecology, and amount of daylight. On Earth, seasons result from Earth's orbit around the Sun and Earth's axial tilt relative to the ecliptic plane. In temperate and polar regions, the seasons are marked by changes in the intensity of sunlight that reaches the Earth's surface, variations of which may cause animals to undergo hibernation or to migrate, and plants to be dormant. Various cultures define the number and nature of seasons based on regional variations. 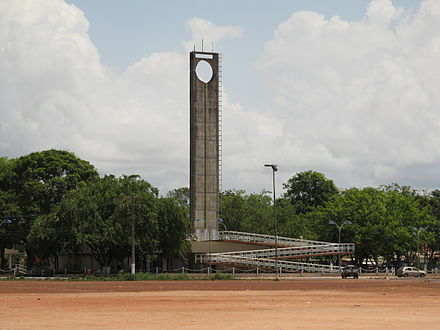 The Marco Zero monument marking the Equator in Macapá, Brazil. Locations on the Equator experience the shortest sunrises and sunsets because the Sun's daily path is nearly perpendicular to the horizon for most of the year. The length of daylight (sunrise to sunset) is almost constant throughout the year; it is about 14 minutes longer than nighttime due to atmospheric refraction and the fact that sunrise begins (or sunset ends) as the upper limb, not the center, of the Sun's disk contacts the horizon. Sunrise is the moment when the upper limb of the Sun appears on the horizon in the morning. The term can also refer to the entire process of the solar disk crossing the horizon and its accompanying atmospheric effects. Sunset, also known as sundown, is the daily disappearance of the Sun below the horizon due to Earth's rotation. As viewed from the Equator, the equinox Sun sets exactly due west in both spring and fall. As viewed from the middle latitudes, the local summer Sun sets to the northwest for the Northern Hemisphere, but to the southwest for the Southern Hemisphere. Sun path, sometimes also called day arc, refers to the daily and seasonal arc-like path that the Sun appears to follow across the sky as the Earth rotates and orbits the Sun. 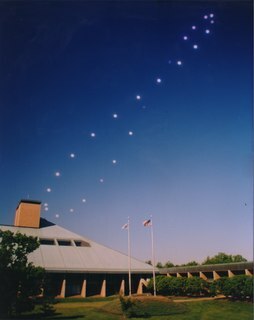 The Sun's path affects the length of daytime experienced and amount of daylight received along a certain latitude during a given season. The International Association of Geodesy (IAG) and the International Astronomical Union (IAU) have chosen to use an equatorial radius of 6,378.1366 kilometres (3,963.1903 mi) (codified as the IAU 2009 value). This equatorial radius is also in the 2003 and 2010 IERS Conventions. It is also the equatorial radius used for the IERS 2003 ellipsoid. If it were really circular, the length of the Equator would then be exactly 2π times the radius, namely 40,075.0142 kilometres (24,901.4594 mi). The GRS 80 (Geodetic Reference System 1980) as approved and adopted by the IUGG at its Canberra, Australia meeting of 1979 has an equatorial radius of 6,378.137 kilometres (3,963.191 mi). The WGS 84 (World Geodetic System 1984) which is a standard for use in cartography, geodesy, and satellite navigation including GPS, also has an equatorial radius of 6,378.137 kilometres (3,963.191 mi). For both GRS 80 and WGS 84, this results in a length for the Equator of 40,075.0167 km (24,901.4609 mi). The geographical mile is defined as one arc-minute of the Equator, so it has different values depending on which radius is assumed. For example, by WSG-84, the distance is 1,855.3248 metres (6,087.024 ft), while by IAU-2000, it is 1,855.3257 metres (6,087.027 ft). This is a difference of less than one millimetre (0.039 in) over the total distance (approximately 1.86 kilometres or 1.16 miles). 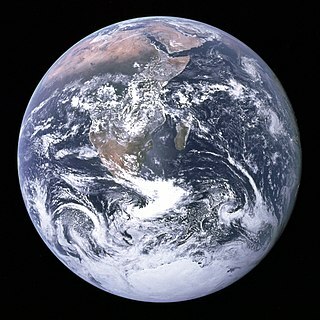 The earth is commonly modeled as a sphere flattened 0.336% along its axis. This makes the Equator 0.16% longer than a meridian (a great circle passing through the two poles). 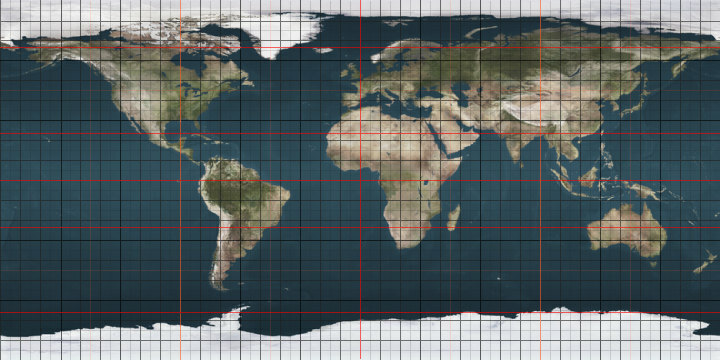 The IUGG standard meridian is, to the nearest millimetre, 40,007.862917 kilometres (24,859.733480 mi), one arc-minute of which is 1,852.216 metres (6,076.82 ft), explaining the SI standardization of the nautical mile as 1,852 metres (6,076 ft), more than 3 metres (9.8 ft) less than the geographical mile. 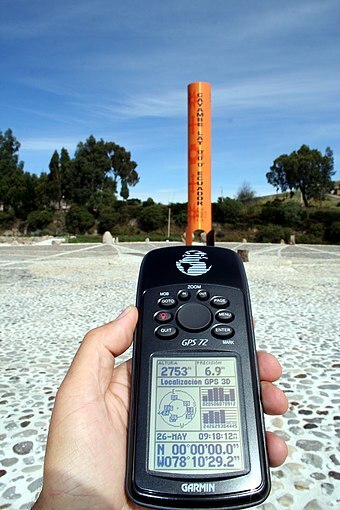 GPS reading taken on the Equator close to the Quitsato Sundial, at Mitad del Mundo, Ecuador. Gulf of Guinea, "Null Island"
Passing through the town of Makoua. Despite its name, no part of Equatorial Guinea lies on the Equator. However, its island of Annobón is 155 km (96 mi) south of the Equator, and the rest of the country lies to the north. Diagram of the seasons, depicting the situation at the December solstice. Regardless of the time of day (i.e. the Earth’s rotation on its axis), the North Pole will be dark, and the South Pole will be illuminated; see also arctic winter. In addition to the density of incident light, the dissipation of light in the atmosphere is greater when it falls at a shallow angle. Seasons result from the tilt of the Earth's axis compared to the plane of its revolution around the Sun. 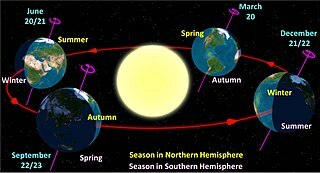 Throughout the year the northern and southern hemispheres are alternately turned either toward or away from the sun depending on Earth's position in its orbit. 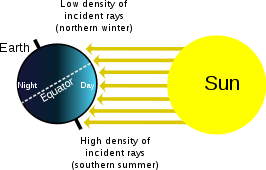 The hemisphere turned toward the sun receives more sunlight and is in summer, while the other hemisphere receives less sun and is in winter (see solstice). At the equinoxes, the Earth's axis is perpendicular to the sun rather than tilted toward or away, meaning that day and night are both about 12 hours long across the whole of the Earth. The Equator lies mostly on the three largest oceans: the Atlantic Ocean, the Indian Ocean, and the Pacific Ocean. Near the Equator there is little temperature change throughout the year, though there may be dramatic differences in rainfall and humidity. The terms summer, autumn, winter and spring do not generally apply. Lowlands around the Equator generally have a tropical rainforest climate, also known as an equatorial climate, though cold currents cause some regions to have tropical monsoon climates with a dry season in the middle of the year, and the Somali Current generated by the Asian monsoon due to continental heating via the high Tibetan Plateau causes Greater Somalia to have an arid climate despite its equatorial location. Average annual temperatures in equatorial lowlands are around 31 °C (88 °F) during the afternoon and 23 °C (73 °F) around sunrise. Rainfall is very high away from cold current upwelling zones, from 2,500 to 3,500 mm (100 to 140 in) per year. There are about 200 rainy days per year and average annual sunshine hours are around 2,000. Despite high year-round sea level temperatures, some higher altitudes such as the Andes and Mount Kilimanjaro have glaciers. The highest point on the Equator is at the elevation of 4,690 metres (15,387 ft), at 0°0′0″N77°59′31″W﻿ / ﻿0.00000°N 77.99194°W﻿ / 0.00000; -77.99194﻿ (highest point on the Equator) , found on the southern slopes of Volcán Cayambe [summit 5,790 metres (18,996 ft)] in Ecuador. This is slightly above the snow line and is the only place on the Equator where snow lies on the ground. At the Equator the snow line is around 1,000 metres (3,300 ft)lower than on Mount Everest and as much as 2,000 metres (6,600 ft) lower than the highest snow line in the world, near the Tropic of Capricorn on Llullaillaco. Longitude, is a geographic coordinate that specifies the east–west position of a point on the Earth's surface, or the surface of a celestial body. It is an angular measurement, usually expressed in degrees and denoted by the Greek letter lambda (λ). Meridians connect points with the same longitude. By convention, one of these, the Prime Meridian, which passes through the Royal Observatory, Greenwich, England, was allocated the position of 0° longitude. The longitude of other places is measured as the angle east or west from the Prime Meridian, ranging from 0° at the Prime Meridian to +180° eastward and −180° westward. Specifically, it is the angle between a plane through the Prime Meridian and a plane through both poles and the location in question. A solstice is an event occurring when the Sun appears to reach its most northerly or southerly excursion relative to the celestial equator on the celestial sphere. Two solstices occur annually, around June 21 and December 21. The seasons of the year are determined by reference to both the solstices and the equinoxes. The equatorial coordinate system is a celestial coordinate system widely used to specify the positions of celestial objects. It may be implemented in spherical or rectangular coordinates, both defined by an origin at the centre of Earth, a fundamental plane consisting of the projection of Earth's equator onto the celestial sphere, a primary direction towards the vernal equinox, and a right-handed convention. Orbital inclination measures the tilt of an object's orbit around a celestial body. It is expressed as the angle between a reference plane and the orbital plane or axis of direction of the orbiting object. 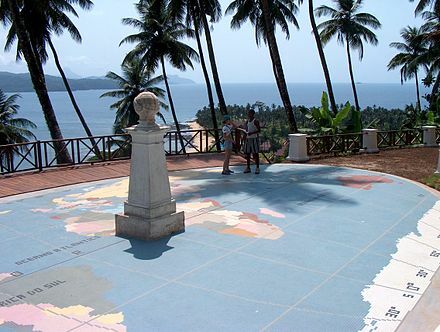 The Tropic of Cancer, which is also referred to as the Northern Tropic, is the most northerly circle of latitude on Earth at which the Sun can be directly overhead. This occurs on the June solstice, when the Northern Hemisphere is tilted toward the Sun to its maximum extent. It is currently 23°26′12.4″ (or 23.43679°) north of the Equator. The Tropic of Capricorn is the circle of latitude that contains the subsolar point on the December solstice. It is thus the southernmost latitude where the Sun can be directly overhead. Its northern equivalent is the Tropic of Cancer. Earth radius is the distance from the center of Earth to a point on its surface. Its value ranges from 6,378 kilometres at the equator to 6,357 kilometres at a pole. Geodesy (/dʒiːˈɒdɨsi/), also named geodetics, is the scientific discipline that deals with the measurement and representation of the Earth. The history of geodesy began in pre-scientific antiquity and blossomed during the Age of Enlightenment. Figure of the Earth is a term of art in geodesy that refers to the size and shape used to model Earth. The size and shape it refers to depend on context, including the precision needed for the model. The sphere is an approximation of the figure of the Earth that is satisfactory for many purposes. Several models with greater accuracy have been developed so that coordinate systems can serve the precise needs of navigation, surveying, cadastre, land use, and various other concerns. In geodesy, a reference ellipsoid is a mathematically defined surface that approximates the geoid, the truer figure of the Earth, or other planetary body. Because of their relative simplicity, reference ellipsoids are used as a preferred surface on which geodetic network computations are performed and point coordinates such as latitude, longitude, and elevation are defined. Earth orbits the Sun at an average distance of 149.60 million km, and one complete orbit takes 365.256 days, during which time Earth has traveled 940 million km. Earth's orbit has an eccentricity of 0.0167. Since the Sun constitutes 99.76% of the mass of the Sun–Earth system, the center of the orbit is extremely close to the center of the Sun. A heliodon (HEE-leo-don) is a device for adjusting the angle between a flat surface and a beam of light to match the angle between a horizontal plane at a specific latitude and the solar beam. Heliodons are used primarily by architects and students of architecture. By placing a model building on the heliodon’s flat surface and making adjustments to the light/surface angle, the investigator can see how the building would look in the three-dimensional solar beam at various dates and times of day. On Earth, daytime is roughly the period of the day during which any given point in the world experiences natural illumination from especially direct sunlight. Daytime occurs when the Sun appears above the local horizon, that is, anywhere on the globe's hemisphere facing the Sun. During daytime, an observer sees indirect sunlight while in the shade, which includes cloud cover. 'Day' is sometimes used instead of 'daytime', in this case 'day' will mean 'the period of light between dawn and nightfall; the interval from sunrise to sunset', which is synonymous with daytime. However, in this context, in order to be clear "daytime" should be used distinguish it from "day" which typically refers to a 24-hour period. A great ellipse is an ellipse passing through two points on a spheroid and having the same center as that of the spheroid. Equivalently, it is an ellipse on the surface of a spheroid and centered on the origin, or the curve formed by intersecting the spheroid by a plane through its center. 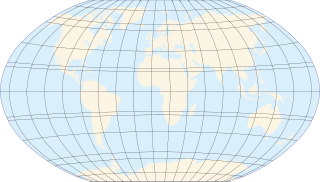 For points that are separated by less than about a quarter of the circumference of the earth, about , the length of the great ellipse connecting the points is close to the geodesic distance. The IERS Reference Meridian (IRM), also called the International Reference Meridian, is the prime meridian maintained by the International Earth Rotation and Reference Systems Service (IERS). It passes about 5.3 arcseconds east of George Biddell Airy's 1851 transit circle or 102 metres (335 ft) at the latitude of the Royal Observatory, Greenwich. It is also the reference meridian of the Global Positioning System (GPS) operated by the United States Department of Defense, and of WGS84 and its two formal versions, the ideal International Terrestrial Reference System (ITRS) and its realization, the International Terrestrial Reference Frame (ITRF). The Antarctic Circle is the most southerly of the five major circles of latitude that mark maps of the Earth. The region south of this circle is known as the Antarctic, and the zone immediately to the north is called the Southern Temperate Zone. South of the Antarctic Circle, the sun is above the horizon for 24 continuous hours at least once per year and the centre of the sun is below the horizon for 24 continuous hours at least once per year ; this is also true within the equivalent polar circle in the Northern Hemisphere, the Arctic Circle. ↑ "Definition of equator". OxfordDictionaries.com. Retrieved 5 May 2018. ↑ "Equator". National Geographic - Education. Retrieved 29 May 2013. ↑ Instituto Geográfico Militar de Ecuador (24 January 2005). "Memoria Técnica de la Determinación de la Latitud Cero" (in Spanish). ↑ "Weather Information for Macapa". ↑ "Weather Information for Pontianak". ↑ "Weather Information for Libreville". 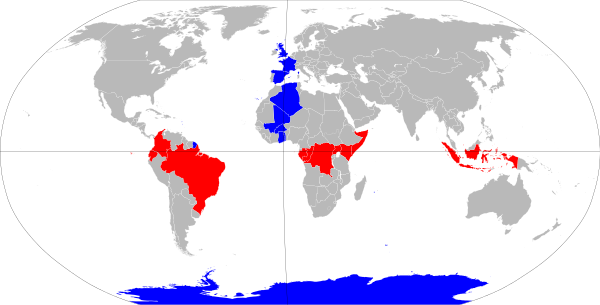 Wikimedia Commons has media related to Equator .